Did you catch my overload of pineapple/flamingo/tropical posts on Instagram and Snapchat this past weekend? In case you missed the updates, my closest friends and I got together for a little summer time fun. We drank from pineapple sippy cups, pushed each other in the pool swam, and went ATV cruising in the forest. We couldn't have asked for a more quintessential summer day; the sun was shining, the music was turned up, and the BBQ was cooking. Perfection! 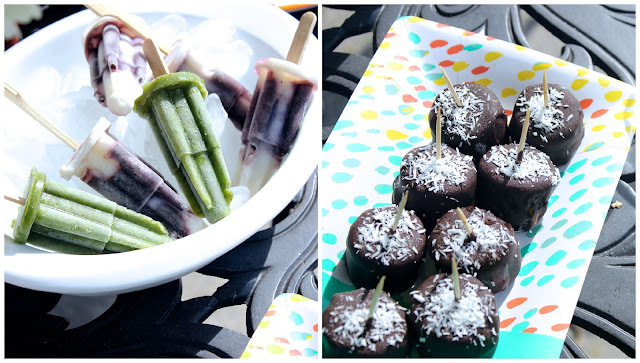 I went back and forth debating if I wanted to re-create this ice cream sandwich bar, or these candy kabobs, but ultimately went for frozen treats (which turned out to be a perfect way to beat the heat). I hadn't made popsicles in years, so when I came across the molds at Dollerama I was thrilled. I opted for my favourite green smoothie in pop version, which was not only delicious but provided a much needed health boost. I've totally been eating the leftovers for breakfast all week and it's perfectly acceptable! You can find the recipe here but it is essentially frozen bananas, kale and almond milk (additions include almond butter, cinnamon, and a touch of vanilla extract). For the purple and white pops I layered vanilla yogurt and frozen blueberries (blended with almond milk and a touch of vanilla extract). Banana and almond butter is probably one of my favourite snacks, but with the heat I prefer to snack on colder fruit. These banana bites have becomes my newest obsession. You can find many variations on Pinterest but the idea is pretty simple to figure out. Slice your banana and spoon a 1/2 teaspoon of almond butter (or peanut butter) on top of half the banana slices. Then put a plain banana slice on top of one covered in almond butter. Stick a toothpick through the bites and put into the freezer until frozen. Melt dark chocolate (I mixed a spoonful of coconut oil into the melting chocolate which will create a "shell" like coating), dip the frozen banana bites, and sprinkle them with coconut flakes. Don't let them thaw too much, you want the ice cream like texture! Serve immediately, or store in freezer until ready to consume. I am already dreaming up more nutty and delicious toppings to sprinkle on! I'd love to know-- what are your favourite summer treats? Would you try a green smoothie pop, or is the idea too weird? I swear there is no "greenness" to be tasted! Are you the next Martha Stewart? I think so!! !